Meningioma is a brain tumor that develops in the meninges. Meningioma is a tumor, developing at the level of the membrane covering the brain: the meninges. The vast majority of meningiomas are benign tumors, which develop as a nodule. More occasionally, this tumor form can invade the cranial box or compress the blood vessels of the brain and the cerebral nerves. It is then a malignant meningioma (malignant tumor). The exact cause of the development of a meningioma is still unknown. However, alterations in the cells of the meninges may be the cause. These abnormalities may in particular cause an abnormal multiplication of these cells, initiating the tumor. Research is currently underway to determine whether alterations in certain genes may be at the origin of this tumor. Or if certain environmental factors, hormonal or otherwise, may be initiators. The general meningioma symptoms are usually of increasing and gradual intensity. Visual impairment: double vision or diplopia , trembling eyes, etc. 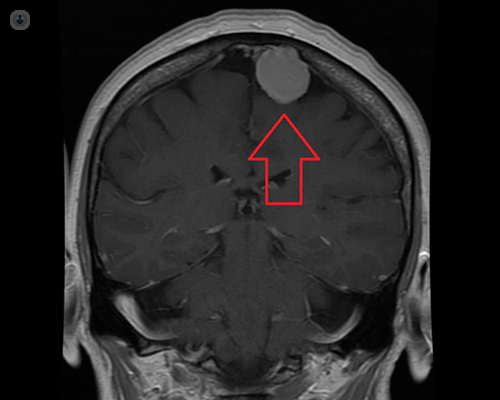 The location of the tumor. In the context of a relatively easy access of the tumor, the effectiveness of the treatment will be all the more important. The size of the tumor. If this is less than 3 cm in diameter, targeted surgery may be a possible alternative. The symptoms felt. In the context of a small tumor, generating no symptoms, the absence of treatment is possible. The level of severity of the tumor. Radiation therapy may be beneficial, following surgery, as part of a Level II or III meningioma. Chemotherapy is, however, rarely used. In this sense, the appropriate treatment then varies from one patient to another. For some, the use of treatment may be optional, while for others, it may be necessary to combine a combination of treatments: surgery, radio surgery, radiotherapy or even chemotherapy.